This article is about the Italian river. For the river in the U.S. state of Virginia, see Mattaponi River. The Po (/poʊ/, Italian: [ˈpɔ]; Latin: Padus or Ēridanus; Ancient Greek: Πάδος, translit. Pádos or Ἠριδανός, Ēridanós; Ancient Ligurian: Bodincus or Bodencus) is a river that flows eastward across northern Italy. The Po flows either 652 km (405 mi) or 682 km (424 mi) – considering the length of the Maira, a right bank tributary. The headwaters of the Po are a spring seeping from a stony hillside at Pian del Re, a flat place at the head of the Val Po under the northwest face of Monviso (in the Cottian Alps). The Po ends at a delta projecting into the Adriatic Sea near Venice. It has a drainage area of 74,000 km² in all, 70,000 in Italy, of which 41,000 is in montane environments and 29,000 on the plain. The Po is the longest river in Italy; at its widest point its width is 503 m (1,650 ft). The Po extends along the 45th parallel north. The river flows through many important Italian cities, including Turin (Torino), Piacenza and Ferrara. It is connected to Milan through a net of channels called navigli, which Leonardo da Vinci helped design. Near the end of its course, it creates a wide delta (with hundreds of small channels and five main ones, called Po di Maestra, Po della Pila, Po delle Tolle, Po di Gnocca and Po di Goro) at the southern part of which is Comacchio, an area famous for eels. 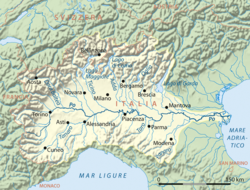 The Po valley was the territory of the Roman Cisalpine Gaul, divided into Cispadane Gaul (South of the Po) and Transpadane Gaul (North of the Po). The Po begins in the Alps, and is in Italy, and flows eastward. The river is subject to heavy flooding. Consequently, over half its length is controlled with argini, or dikes. The slope of the valley decreases from 0.35% in the west to 0.14% in the east, a low gradient. There are also 450 standing lakes. It is characterized by its large discharge (several rivers over 1,000 km have a discharge inferior or equal to the Po). The vast valley around the Po is called the Po Basin or Po Valley (Italian Pianura Padana or Val Padana); in time it became the main industrial area of the country. In 2002, more than 16 million people lived there, at the time nearly ⅓ of the population of Italy. The two main economic uses of the valley are for industry and for agriculture, both major uses. The industrial centres, such as Turin and Milan, are located on higher terrain, away from the river. They rely for power on the numerous hydroelectric stations in or on the flanks of the Alps, and on the coal/oil power stations which use the water of the Po basin as coolant. Drainage from the north is mediated through several large, scenic lakes. The streams are now controlled by so many dams as to slow the river's sedimentation rate, causing geologic problems. The expansive, moist and fertile flood plain is reserved mainly for agriculture and is subject to flash floods, even though the overall quantity of water is lower than in the past and lower than demand. The main products of the farms around the river are cereals including – unusually for Europe – rice, which requires heavy irrigation. The latter method is the chief consumer of surface water, while industrial and human consumption use underground water. The Po along the city of Turin. Horse riding along the Po Delta. Map of the Po Delta. The Po Delta wetlands have been protected by the institution of two regional parks in the regions in which it is situated: Veneto and Emilia-Romagna. The Po Delta Regional Park in Emilia-Romagna, the largest, consists of four parcels of land on the right bank of the Po and to the south. Created by law in 1988, it is managed by a consortium, the Consorzio per la gestione de Parco, to which Ferrara and Ravenna provinces belong as well as nine comuni: Comacchio, Argenta, Ostellato, Goro, Mesola, Codigoro, Ravenna, Alfonsine, and Cervia. Executive authority resides in an assembly of the presidents of the provinces, the mayors of the comuni and the board of directors. They employ a Technical-Scientific Committee and a Park Council to carry out directives. In 1999 the park was designated a World Heritage Site by UNESCO and was added to "Ferrara, City of the Renaissance, and its Po Delta." The 53,653 ha (132,580 acres) of the park contain wetlands, forest, dunes and salt pans. It has a high biodiversity, with 1000–1100 plant species and 374 vertebrate species, of which 300 are birds. The most recent part of the delta, which projects into the Adriatic between Chioggia and Comacchio, contains channels that actually connect to the Adriatic and on that account is called the active delta by the park authorities, as opposed to the fossil delta, which contains channels that no longer connect the Po to the Adriatic (but once did). The active delta was created in 1604 when the city of Venice diverted the main stream, the Po grande or Po di Venezia, from its channel north of Porto Viro to the south of Porto Viro in a channel then called the Taglio di Porto Viro, "Porto Viro cut-off". Their intent was to stop the gradual migration of the Po toward the lagoon of Venice, which would have filled up with sediment had contact been made. The subsequent town of Taglio di Po grew around the diversionary works. The lock of Volta Grimana blocked the old channel, now the Po di Levante, which flows to the Adriatic through Porto Levante. Below Taglio di Po the Parco Regionale Veneto, one of the tracts under the authority of the Parco Delta del Po, contains the latest branches of the Po. The Po di Gnocca branches to the south followed by the Po di Maestra to the north at Porto Tolle. At Tolle downstream the Po di Venezia divides into the Po delle Tolle to the south and the Po della Pila to the north. The former exits at Bonelli. The latter divides again at Pila into the Busa di Tramontana to the north and the Busa di Scirocco to the south, while the mainstream, the Busa Dritta, enters Punta Maistra and exits finally past Pila lighthouse. Despite the park administration's definition of the active delta as beginning at Porto Viro, there is another active channel upstream from it at Santa Maria in Punta, where the Fiume Po divides into the Po di Goro and the Po di Venezia. The fossil Po is the region of no longer active channels from the Po to the sea. It begins upstream from Ferrara. The Fiume Po currently flowing to the north of Ferrara is actually the result of a diversion at Ficarolo in 1152 made in the hope of relieving flooding in the vicinity of Ravenna. The diversion channel was at first called the Po di Ficarolo. The Fiume Po before then followed the Po di Volano, no longer connected to the Po, which ran to the south of Ferrara and exited near Volano. In Roman times it did not exit there but ran to the south as the Padus Vetus ("old Po") exiting near Comacchio, from which split the Po di Primaro exiting close to Ravenna. Before 1152 the seaward extension of today's delta, about 12 km (7.5 mi), did not exist. The entire region from Ravenna to Chioggia was dense swamps, explaining why the Via Aemilia was constructed between Rimini and Piacenza and did not begin further north. The Mediterranean Basin is a depression in the Earth's crust caused by the African Plate slipping under the Eurasian Plate. Typically in geologic history the depression is filled with sea water under various geologic names such as Tethys Sea. In the last period of the Miocene Epoch, the Messinian (7–5 mya), the Messinian salinity crisis, a near drying of the Mediterranean, was caused by the sea level dropping below the sill at the Strait of Gibraltar and the equilibrium between evaporation and replenishment shifting in favor of evaporation. At that time the Po Valley and the Adriatic depression were a single canyon system thousands of feet deep. On the southwest the Apennine Mountains bordered a land mass termed Tyrrhenis geologically. Their orogeny was just being completed in the Miocene. On the north the Alpine Orogeny had already created the Alps. At the end of the Messinian the ocean broke through the sill and the Mediterranean refilled. The Adriatic transgressed into all of northern Italy. In the subsequent Pliocene sedimentary outwash primarily from the Apennines filled the valley and the central Adriatic generally to a depth of 1,000 m (3,300 ft) to 2,000 m (6,600 ft) but from 2,000 m (6,600 ft) to 3,000 m (9,800 ft) off the current mouth of the Po, with pockets as deep as 6,000 m (20,000 ft). At the start of the Pleistocene the valley was full. Cycles of transgression and regression are detectable in the valley and the Adriatic as far as its centre and in the southern Adriatic. From the Pleistocene alternation of maritime and alluvial sediments occur as far west as Piacenza. The exact sequences at various locations have been studied extensively. Apparently the sea advanced and receded over the valley in conformance to an equilibrium between sedimentation and glacial advance or recession at 100,000-year intervals and 100 m (330 ft) to 120 m (390 ft) fluctuation of sea level. An advance began after the Last Glacial Maximum around 20,000 years ago, which brought the Adriatic to a high point at about 5500 years ago. Since then the Po delta had been prograding. The rate of coastal zone progradation between 1000 BC and 1200 AD was 4 m/yr. Human factors, however, brought about a change in the equilibrium in the mid-20th century with the result that the entire coastline of the northern Adriatic is now degrading. Venice, which was originally built on islands off the coast, is most at risk due to subsidence, but the effect is realized in the Po delta as well. The causes are first a decrease in the sedimentation rate due to the locking of sediment behind hydroelectric dams and the deliberate excavation of sand from rivers for industrial purposes. Second, agricultural use of the river is heavy; during peak consumption the flow in places nearly dries up, causing local contention. As a result of decreased flow salt water is intruding into the aquifers and coastal ground water. Eutrophication in standing waters and streams of low flow is on the increase. The valley is subsiding due to the removal of ground water. Always prone to fog, the valley is subject to heavy smog due to industrial atmospheric emissions, especially from Turin. In 2005, water from the Po was found to contain "staggering" amounts of benzoylecgonine, which is excreted by cocaine users in urine. Based on these figures, cocaine consumption was estimated to be about 4 kg daily, or 27 doses per day per thousand young adults in areas that feed into the river—a number nearly three times higher than previous estimates. On February 24, 2010 the Po was contaminated by an oil spill coming from a refinery in Villasanta through the Lambro, the Agenzia Nazionale Stampa Associata news agency has estimated that the spill is in the neighborhood of 600,000 liters. Until 1989 water resources were administered regionally or locally. The major authority on the lower Po was the Magistrato alle Acque di Venezia, first formed in the 16th-century Republic of Venice. It made all the decisions concerning the diversion of the lower river. Most part of the delta is still in Veneto. In 1907 under the Kingdom of Italy the agency became the Magistrato alle Acque and took responsibility for all the water resources in northeastern Italy. Currently it is a decentralized institution of the Ministry of Public Works, headed by a chairman appointed by the Head of State and the Council of Ministers. Its headquarters are in Venice. Its domain is the management and protection of the water system in Veneto, Mantua, Trento, Bolzano and Friuli-Venezia Giulia. In 1989 in response to the major geologic problems that were developing along the river Law no. 183/89 was passed authorizing The Po Basin Water Board (Autorità di bacino del fiume Po), which would direct operations concerning all the water resources in the Po basin (see under Po Valley). Its headquarters have been in Parma since its inception in 1990. It considers itself a synergy among all the institutions concerned with the preservation and development of the Po basin. It is administered by officials chosen from the administrations of the constituent regions and provinces. In the year 2009 the water board will initiate an Integrated River Basin Management Plan in compliance with the European Union (EU) Water Framework Directive, 2000/60/EC. The plan includes many water management and flood risk plans already in place. Between 2009 and 2015 the Po Valley Project (the implementation of the plan) will carry out more than 60 measures to heighten and strengthen dikes, increase natural retention areas, recover sediment transport, recover hydromorphological characteristics, enlarge wetlands, afforest, renaturate, promote biodiversity and promote recreational use, among others. At the village of Isola Serafini in the comune of Monticelli d'Ongina, Piacenza Province, 40 km (25 mi) downstream from Piacenza, a 362 m (1,188 ft) long, 20 m (66 ft) high gate dam featuring eleven 30 m (98 ft) openings gated by vertical lift gates, crosses the Po. Nine gates are 6.5 m (21 ft) high and two are 8 m (26 ft) high for sediment-scouring purposes. A spillway to the right passes through a hydroelectric station of 4 generators of 76 MW each operated by a 3.5–11 m (11–36 ft) head of water. The spillway connects to a diversionary canal subtending a 12 km (7.5 mi) loop of the Po. A ship lock 85 m (279 ft) long and 12 m (39 ft) wide next to the station passes some traffic through the canal, but above the dam traffic is mainly barges. The average flow at the dam is 854 m³/s, with a 12,800 m³/s maximum. The Reno (R) was a tributary of the Po until the middle of the eighteenth century when the course was diverted to lessen the risk of devastating floods. The Po is first certainly identified in the Graeco-Roman historians and geographers of the late Roman Republic and the early Roman Empire, long after the valley had been occupied successively by prehistoric and historic peoples: Ligures, Etruscans, Celts, Veneti, Umbri, and Romans. At that late date the ancient authors were attempting to explain the provenance of the name. Perhaps the earliest of these, Polybius (2nd century BC), uses Pados (in Greek) and says that it was to be identified with the Eridanos of the poets. Moreover, the country people call it Bodencus. This implies that a "country" population either remained from prehistoric times or adopted the name in use by that substrate. The name has been segmented as Bod-encus or Bod-incus, the suffix being characteristic of the ancient Ligurian language of northern Italy, southern France, Corsica and elsewhere. Pliny the Elder has the most to say about the Padus of his times. Herodotus had expressed doubt concerning the existence of a river in Europe, Eridanos, which flowed into the northern sea, he said, from which amber came. He believed it was a Greek name (there are other Eridanos rivers in Greece), "invented by some poet," but makes no conjectures as to where it might be. Pliny points out that in his own time the Eridanos had become wrongly identified with the Padus. He does not know when or how, but like Herodotus he blames the poets. Amber is supposed to have come from there. Phaëthon, son of the sun, struck by lightning changed into poplars and exuded tears every year, which is the source of amber (a myth of Pausanias). Expressing surprise at the ignorance of the poets, Pliny says "There can be no doubt that amber is the product of the islands of the northern ocean (Baltic Sea)" and attributes its introduction into the Po valley to the Veneti, the last link in a trade route to the north through Pannonia and Germany. Pliny (Hist. Nat., iii. 122) also gives the Ligurian name of the Po as Bodincus, which he translates as "bottomless". The root bod- has been generally analyzed as containing the PIE base *bhu(n)d(h)- seen in Sanskrit budhnah and Avestan buna- "bottom", Greek pythmen "foundation", Latin fundus "bottom", Old Irish bond "sole of the foot". The word Bodincus appears in the place name Bodincomagus, a Ligurian town on the right bank of the Po downstream from today’s Turin. The Po is often identified with the Eridanos or Eridanus river of Greek mythology. This mythical river is the namesake of the constellation Eridanus. ^ a b c d e f Zwingle, Erla (May 2002). "Italy's Po River Punished for centuries by destructive floods, northern Italians stubbornly embrace their nation's longest river, which nurtures rice fields, vineyards, fisheries—and legends". National Geographic. Retrieved 6 April 2009. ^ "Carta d'identità". Parco Delta del Po: Emilia-Romagna. Archived from the original on 23 April 2009. Retrieved 14 April 2009. ^ "Protected Area". Parco del Delta del Po. Retrieved 14 April 2009. ^ "Active Delta and Fossil Delta". Parco Delta del Po Veneto. Archived from the original on 21 June 2009. Retrieved 15 April 2009. ^ Grove, Alfred Thomas; Oliver Rackham (2003). The Nature of Mediterranean Europe: An Ecological History (2, illustrated ed.). Yale University Press. p. 341. ISBN 978-0-300-10055-6. ^ McKinney, Frank Kenneth (2007). "Chapter 6: Pleistocene and Holocene Sediments". The northern Adriatic ecosystem: deep time in a shallow sea (illustrated ed.). Columbia University Press. ISBN 978-0-231-13242-8. ^ J.P.M. Syvitski; et al. (October 2005). "Distributary channels and their impact on sediment dispersal". Marine Geology. Elsevier. 222–223 (15): 75–94. doi:10.1016/j.margeo.2005.06.030. ^ "Facing Water Challenges in the Po River Basin, Italy:A WWDR3 Case Study". waterwiki.net. 2009. Retrieved 6 April 2009. ^ "Haze in the Po River Valley, Italy". NASA Earth Observatory. 2009. Retrieved 6 April 2009. ^ Recchia, Roberto. "IL QUADRO DEL SISTEMA IDRICO DEL COMUNE DI MILANO". Comune di Milano. Archived from the original on 23 September 2015. Retrieved 7 September 2015. ^ "Italian river 'full of cocaine'". BBC News. 5 August 2005. Retrieved 6 April 2009. ^ "Oil spill threatens Italy's Po River". CBC News. 24 February 2010. Retrieved 24 February 2010. ^ "L'Ente" (in Italian). Autorità di bacino del fiume Po. Retrieved 5 June 2009. ^ "Elements of Good Practice in Integrated River Basin Management: A Practical Resource for implementing the EU Water Framework Directive" (PDF). Brussels, Belgium: WWF–World Wide Fund For Nature (formerly World Wildlife Fund). October 2001. Retrieved 6 June 2009. ^ Brunelli, A.; D. Caputo; F. Chillè; V. Maugliani (2003). "The bump of a boat into a gate-structure dam: An unusual risk scenario". In Llanos, JA; Yague, J. (eds.). Dam Maintenance and Rehabilitation: Proceedings of the International Congress on Conservation and Rehabilitation of Dams, Madrid, Spain, 11–13 November 2002 (illustrated ed.). Taylor & Francis. pp. 145–146. ISBN 978-90-5809-534-3. ^ Daiches, David; Anthony Thorlby (1972). Literature and western civilization (illustrated ed.). Aldus. p. 78. ^ Historia Naturalis, Book 37, Chapter 11. Wikimedia Commons has media related to Po river. Wikisource has the text of the 1911 Encyclopædia Britannica article Po. "Flooding on the Po River, Italy, as imaged by RADARSAT-1". Canada Centre for Remote Sensing. 2000. Archived from the original on 21 June 2009. Retrieved 6 April 2009. "Ferrara, City of the Renaissance, and its Po Delta". World Heritage Centre, UNESCO. 1992–2009. Retrieved 14 April 2009. This page was last edited on 16 March 2019, at 00:51 (UTC).